John Terry joins Aston Villa – Royal Times of Nigeria. 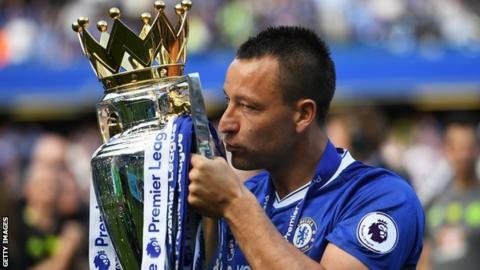 Chelsea legend John Terry has signed a one-year deal with the Championship club Championship side Aston Villa after his glittering career at Stamford Bridge came to an end at the close of the 2016-17 season. The move was confirmed by Villa owner and chairman Tony Xia on Monday. Terry, who won 78 caps for England, played 717 games for Chelsea and won his fifth Premier League title in May. Villa finished 13th in the Championship last season but Steve Bruce’s side are among the favourites to win automatic promotion to the top flight in 2017-18. Terry told Aston Villa’s website: “It’s a club I have admired from afar for many years. “There are fantastic facilities at Bodymoor Heath, Villa Park is one of the finest stadiums in the country and there’s a good group of players here, with an experienced and successful manager in Steve Bruce.